We have enrolled our daughter into a music program. This is the third semester of it. Basically it involves a lot of simple songs with simple instruments. If my daughter is ever unable to attend a class, I probably won’t end up going either. I feel that I already know most of the songs anyways. Speaking of anyways, since we have moved into the new neighborhood I have found that the residents are much more pleasant here. It has been difficult to get used to. I would say about 90% of my neighbors that drive by give some sort of acknowledgment of me when they see me. This is a far cry from where I used to live. On that street, it didn’t matter how many bottle rockets you fired at a person’s car, you couldn’t get the time of day. So naturally it took some getting used to. My first attempt at initiating a wave when I was out shoveling resulted in some guy raising his hook hand at me and slicing it through the air in my direction. I ran screaming into my house and was never heard from again. The next time I tried it, I was confronted in a very similar manner, although this guy had a spatula for a hand and just waved it at me. I again ran screaming into my house. 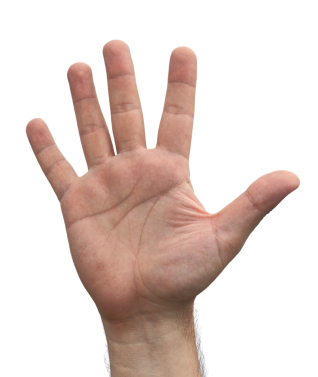 The final time a car attempted to drive by my house, I had already put a bunch of spikes in the street and dug a 30 foot trench and put electric sharks in it, so…..
Below is a picture taken of Spatula Hand’s other hand, which I call Regular Hand.